A just okay rehash/reboot of a superhero movie and a movie falsely glorifying romance with a Muslim were the new movies that debuted at theaters, last weekend. 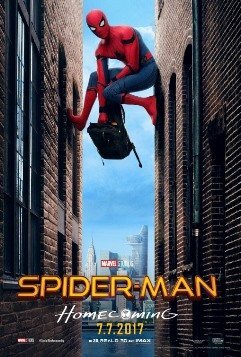 * Spider-Man: Homecoming – Rated PG-13: While this new version of Spider Man is fine and mostly not objectionable, I fail to see the reason it needed to be made (other than big, huge, giant piles of money they knew they would and did make). The movie doesn’t give you the back story of Spider Man or how Peter Parker was orphaned and ends up with Aunt May (a younger, sexier Aunt May played by Marisa Tomei), though I guess at this point they expect everyone knows. There are hints and tidbits when Peter Parker gets found out by his fat Asian friend (this movie is both multi-cultural and multi-calorical). To me, the more appealing star in this movie is Michael Keaton as the villain, Adrian Toomes a/k/a “Vulture.” And I liked his back story. He becomes a villain only after he is ripped off by city bureaucrats and politicians. At the beginning of the movie, Toomes is the owner of a construction company that is clearing out damaged buildings and structures in the city, caused by aliens. As soon as he begins the job (and after he’s invested in expensive equipment), bureaucrats take the job away from him, and he’s stuck with the debt and the anger and frustration about what’s just happened to him. But he discovers that there’s something about the alien material he’s cleaned out. Meanwhile, Peter Parker–training to save people as Spider Man and not quite getting it right–is not one of the popular kids at school. In fact, he’s kind of on the outs. He is the smartest kid in school, but not liked so much, as he’s a nerd of sorts. He has a crush on one of his classmates, but she loves Spider Man (she doesn’t know he’s Parker). There is a twist in the movie you won’t see coming. It’s not major to the plot, but still I would have never figured it out ahead of time. The movie is just okay. But it’s way too long, clocking in at two hours and thirteen minutes. And it’s quite repetitive. I also could have done without the Zendaya character. She utters a line that was completely unnecessary. When Peter’s school’s academic team comes to Washington, DC for a competition, Zendaya refuses to enter the Washington Monument, letting us all know that she “can’t honor anything that was built by Black slaves.” Gee, I hope she never goes to the Middle East, where Blacks are still enslaved . . . and are building a great deal. 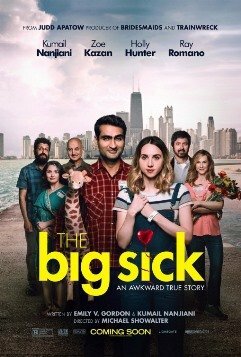 * The Big Sick – Rated R: Ick. I didn’t like this movie at all. The main point of it seems to be to glamorize and sanitize relationships with and marriages to Muslims. Oh, how romantic (or at least that’s what leftist self-hating Jew Judd Apatow and the others who made this dreck apparently want us to think). That’s probably why they didn’t show us the Muslim wedding the non-Muslim chick had to go through in the real-life story on which this is based. Here’s some more info not shown at the end of the movie: He, the Muslim, did NOT go through a Christian wedding ceremony for his wife. I’d love for them to find an example of a famous Muslim female comedian who gave up Islam for her Christian husband . . . and make a movie about the resulting honor killing. But you’ll never see that from Judd Apatow or the rest of his Hollywood apparatchiks. Oh, and by the way, this is supposed to be a romantic comedy. But it definitely isn’t romantic (no matter how desperately they try to make you think it is) and it certainly isn’t funny. I laughed maybe five times. For most of the rest of the movie, I was more annoyed than humored. Emily V. Gordon is a former therapist and North Carolinian who married unfunny Pakistani Muslim “comedian” (and King of Unibrowistan) Kumail Nanjiani. This is supposed to be the story of how they met. Nanjiani plays himself. He is an aspiring comedian and Uber driver. She is played by Zoe Kazan, who sees him at one of his stand up shows and cheers. But her cheers are mistaken for heckling, he heckles back, and eventually they meet. They sleep together that night and “date” (euphemism), until she discovers that he’s only passing the time with her. He will probably marry one of the many Pakistani Muslim women his devout parents keep trying to set him up with. So, she breaks up with him. But then Emily gets very sick and Nanjiani takes her to the hospital, where she’s put in an induced coma for about a month. Nanjiani meets Emily’s parents (the incredibly annoying Holly Hunter and Ray Romano), who at first don’t like him for being the reason for the break-up. But then they warm to him during their daughter’s coma. Gee, that’s not predictable at all. Like I said, I hated this movie because it romanticizes “Big Muslim Love” (also very predictable). Jihadists should love it . . . if they can sit through it. I found it to be slow and boring. None of the characters are particularly likable or endearing, either. The only good thing about this movie is when Nanjiani tells his parents that their Islam is “an antiquated idea of how I should live my life.” But they are shown to be loving, accepting parents who only briefly “disown” their son (and they don’t really disown him at all) and actually accept him and his new girlfriend (and why shouldn’t they since she married in an Islamic ceremony and gave in). There’s also a stock anti-Muslim bigot in the audience of one of Nanjiani’s shows who attacks him for being Muslim–awwww, they’re soooo oppressed. Of course, we see Emily’s mother (Hunter) attack the guy. Yup, better they should stand up for the jihad. Yay. Before it was even halfway over, I was big sick of The Big Sick. I thought that the depiction of ‘The Vulture’ was an oblique way of attacking Trump supporters, since Adrian Toomes fit that mold perfectly of business owner who gets screwed by the establishment. Portrayal: Trump supporter, after getting screwed, turns to crime and is on a rampage, until Spidey stops him. Thanks for the great reviews Debbie. I’m taking the family this weekend to see the Spiderman movie and will gladly skip The Big Sicko. Have a great day and keep up the good work. Hey Debbie. I’m sorry if you misunderstood what I said abou War For Planet Of The apes though I still maintain my thoughts on classic being longer and studio meddling. Now with Spider Man it’s utterly annoying how they remade long time characters Ned Leeds and Liz Allen into being Asian and Black when they’ve always been white. Nobodsdy would dare do this to black characters, Clint Eastwood joked he wouldn’t make Nelson Mandela white in Invictus. The Big Sick sounds like they ripped off My Big Fat Greek Wedding only making it Muslim.Well have a nice day. Your blog is always stands for writing the best articles.Thanks a lot for sharing this magnificent post.